The Night is Short, Walk on Girl is the romantic comedy anime film based on the novel of the same name written by Morimi Tomihiko and illustrated by Nakamura Yusuke. This surreal adventure doesn’t have a strong plot, but you will be drawn in to its strange world and lighthearted take on college life and romance immediately. The story follows two college students on a rollicking night on the town in Kyoto. Kōhai (or junior) is a young college woman who start the night crashing college parties and playing drinking games. She seems to have a superhuman ability to imbibe alcohol and outdrink her companions. Meanwhile, Senpai (or senior), has tried to attract her attention and romance her from afar. He ends up on a separate adventure in which he crosses paths with a pervert and tries to track down a famous book, Ratatam, so he can give it to Kohai. 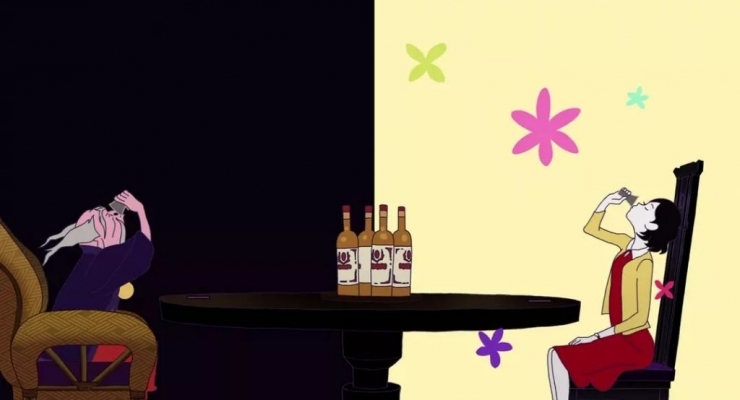 The Night is Short, Walk on Girl slowly builds to a more and more visually and situationally surreal story as it progresses. What starts out as an already dizzyingly fascinating night out on the town for college kids have fun turns into a wild series of vignettes that incorporate lots of symbolism and mythology, such as Kōhai takes on a mythic imbiber and slakes her thirst with a mythical drink in a weird drinking contest. There is no way to really describe The Night is Short, Walk on Girl other than to say you have to experience its visual sumptuousness for yourself. The story is not linear, but it does have an underlying theme of romance and enjoying life to its fullest. Director Yuasa Masaaki brings all of its visual and aural elements together in a splendiferous way, making this the rare anime feature film that distinctly separates itself from the strong and well-established influences of Studio Ghibli and Miyazaki Hayao. 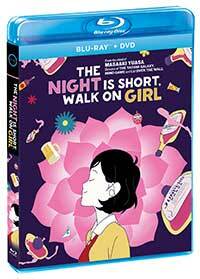 The Night is Short, Walk on Girl arrives on Blu-ray from Shout! And GKIDS in a beautiful 1.77:1 AVC 1080p encodement. The colors are very vibrant, especially Kōhai’s ruby-red dress. The color fills are clean and line art crisp, with little noise or color banding. We get the original-language Japanese track in DTS-HD Master Audio 5.1 along with English subtitles as well as French subtitles. The audio mix is wonderfully balanced and full of atmosphere, lots of discrete effects, and extended low end that underpins the film’s wild action sequences. The interview with director Masaaki Yuasa is brief but interesting and the included trailers and tv spots will obviously be of interest to anime fans. A fascinating fantasy/romance that really defies categorization, filled with beautiful animation, bursting with youthful exuberance, and the sense of nighttime adventure. The Night is Short, Walk on Girl should be in any otaku’s collection, but this film’s appeal is not limited to only those who love anime. Two college students experience an exuberant nighttime adventure in Kyoto in this gorgeously animated and glorious anime feature film from director Yuasa Masaaki. The Blu-ray has vivid, crisp, reference-level picture quality and a fantastic lossless DTS-HD Master Audio 5.1 Japanese soundtrack.